Ryken Hall was a classroom building that had been vacant for several years and had fallen into serious disrepair. The building was added onto and transformed by Woodman Associates into the new Art Center for Saint John's Preparatory School. The center includes a black box theater with supporting facilities, music rehearsal rooms and a performance space, art studios, and classrooms. 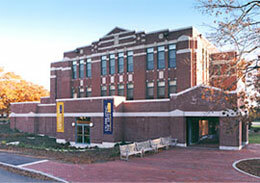 Woodman Associates also worked on a campus master plan prior to beginning work on Ryken Hall. The master plan evaluated the conditions and uses of a number of classroom buildings, establishing needs for the school and the most suitable location for new facilities.